On November 17, 2017, Mao-tai group "Meeting in Africa through the Unique Aroma" activity was held at the international conference center in Cape Town. China's national liquor Kweichow Mao-tai has launched a promotion drive in Cape Town in a bid to enter the African market. The operation was rolled out with an official event that featured diplomats, government officials, as well as cultural and business representatives from both China and South Africa. The event, addressed by Mao-tai Group General Manager Li Baofang who led the delegation of nearly 100 Chinese business people, was convened under the theme: "Meeting in Africa through the Unique Aroma -- China Kweichow Mao-tai, the Belt and Road Branding Initiatives in South Africa." Also featured prominently among the speakers were Cape Town Deputy Mayor Alderman Ian Neilson and Yaw Peprah, Chief Operating Officer of WESGRO, the official trade and investment opportunities promotion agency for Cape Town and the Western Cape Province. Mao-tai is one of China's flagship companies that has been able to showcase global success and sustainability with a market value of more than 120.3 billion U.S. dollars. Sketching the pathway that Mao-tai has travelled to achieve the distinction of being the number one brand of distilled spirits in both the Chinese and international markets, Li described the branding initiative in Cape Town as the first stop in a broader continental project that was underpinned by strong cooperation between China and South Africa. 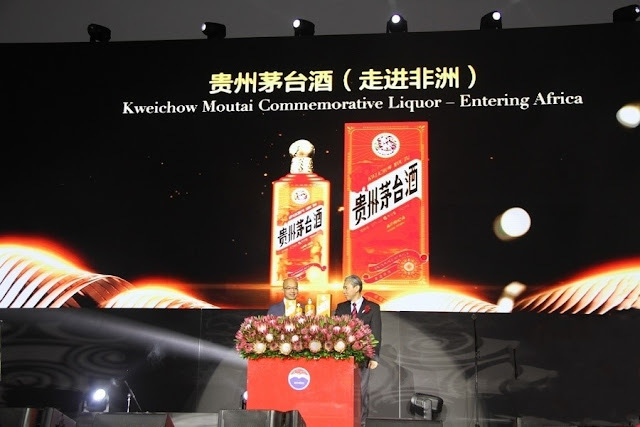 Li added that this is "a win-win cooperation between Moutai and the rest of the world, involving cultural exchanges and economic cooperation." The entry of Moutai into the South African market will contribute to the South African economy, Li said. "There is a huge space and opportunity to collaborate, and by working together we can build a rainbow bridge between Africa and China," he said. Neilson said it was a great honor for the city to host this groundbreaking initiative and that Cape Town, which is strategically positioned on the West Coast of South Africa, has much to offer. He highlighted the fact that many of South Africa's financial and consulting groups were based in the city and that two thirds of South Africa's green industry manufacturing happens in the province. "We were recently designated a special economic zone and have launched a business brand initiative called Invest Cape Town," Neilson said. "With China's Belt and Road Initiative, we are uniquely positioned," the deputy mayor added. Speaking on behalf of WESGRO, Peprah explained that there were important areas of cooperation. "Being part of BRICS, we see China as a very important market for us," Peprah noted. You can also contact eGTCP.com directly via mail or phone.